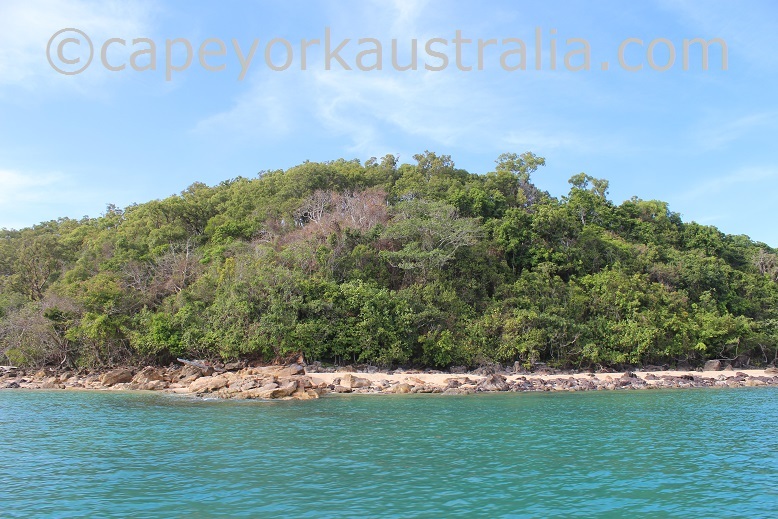 Mutee Head is a big headland north of Jardine river mouth. 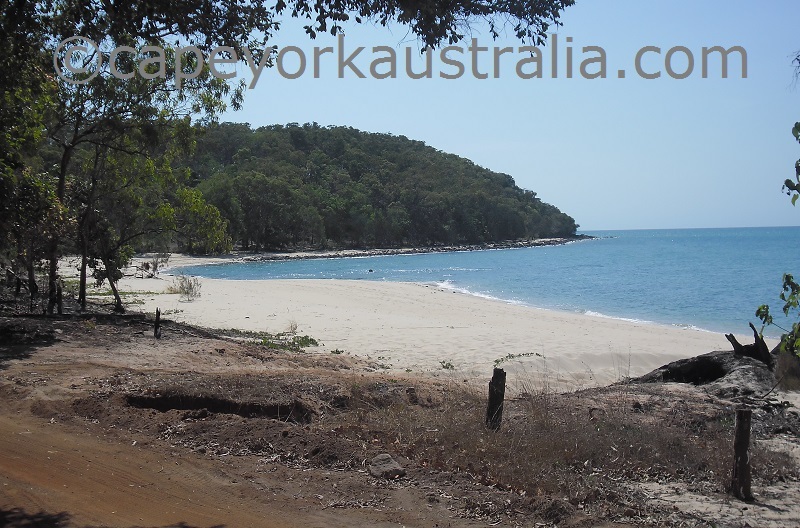 Other than the headland itself, there are also some Second World War relics, Saibai Islander graves, and a beautiful beach. 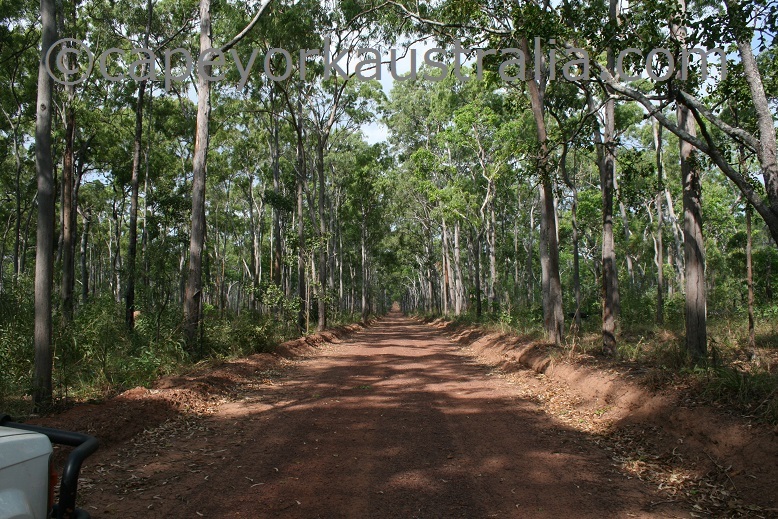 The spot is reached from the main road that goes north to Bamaga, in the NPA (north of Jardine River). 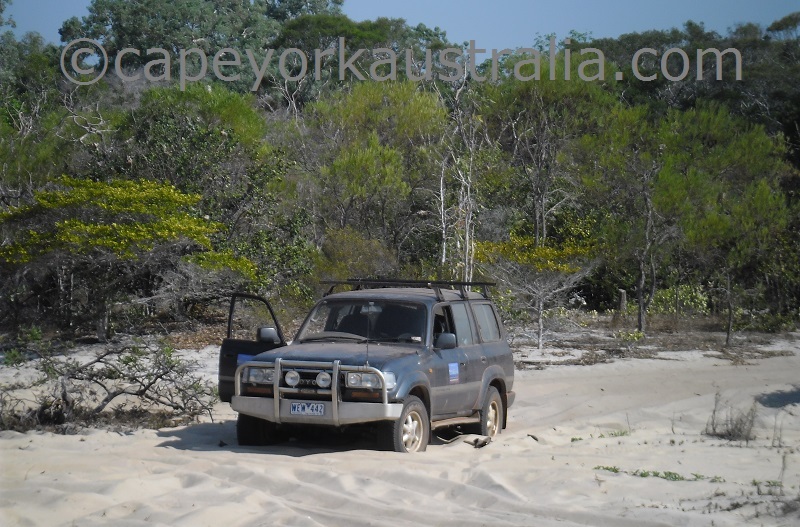 And if you like fishing and discovering, there is also a small track west to the mouth of Jardine River. 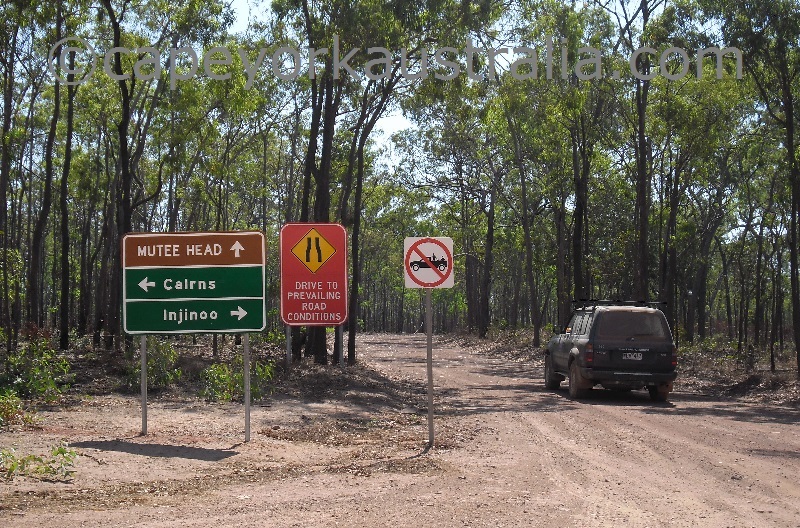 At the turnoff from the main road, there is now even a road sign saying Mutee Head. 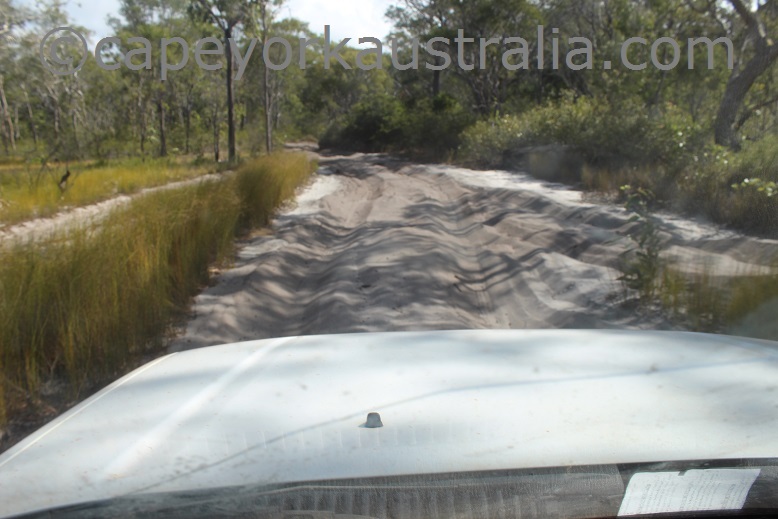 The road in is a resonably good gravel road, doable in two wheel drive during the dry season. Up on the hill behind the beach is a Second World War radar tower, reachable by a track that turns off the road in, not far from the beach. The beach is beautiful and not bad for fishing. 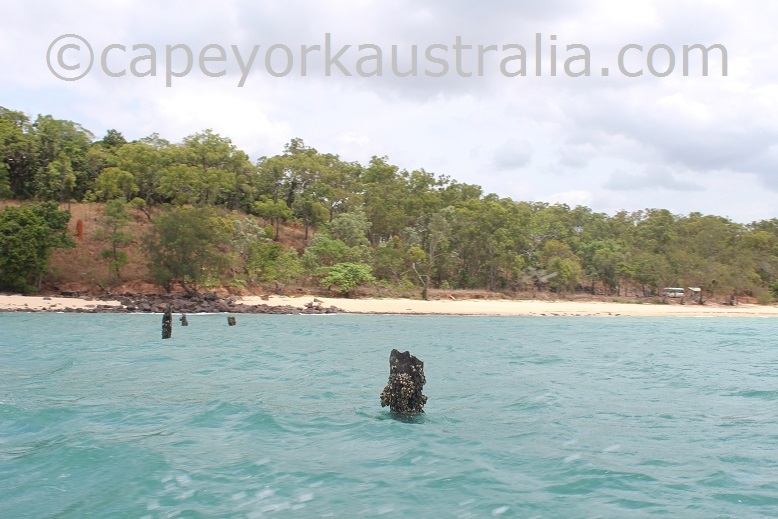 The old poles sticking out of the water is what is left from a Second World War jetty, which was later useful for the community of Saibai islanders. 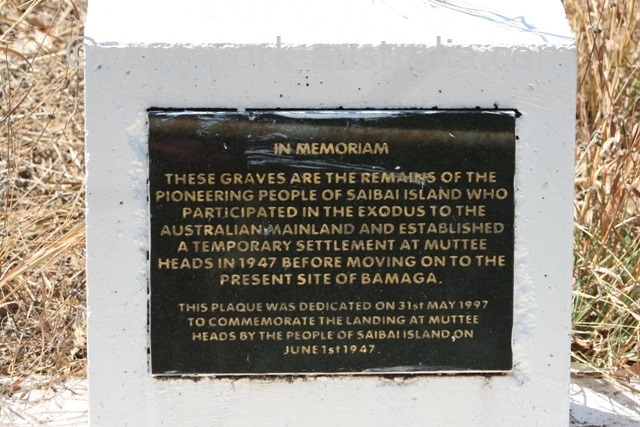 Yes - the WWII relics were already here when the first Saibai islanders came to settle on the mainland in 1947. They first settled in the Mutee Head because the WWII water tanks and the jetty were handy. 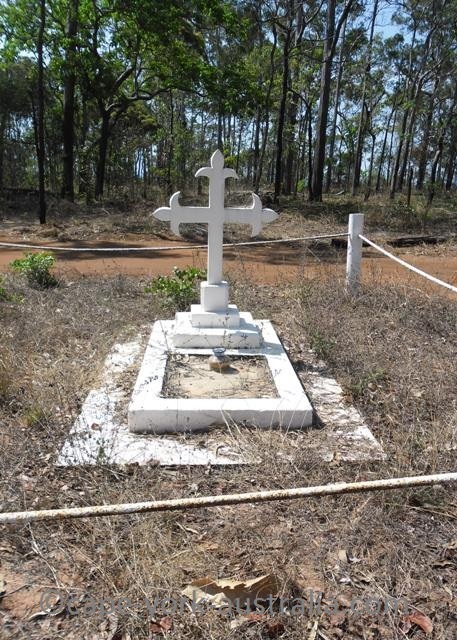 The Government erected a temporary church, store and medical post. As more and more families arrived, old army huts were used for housing. 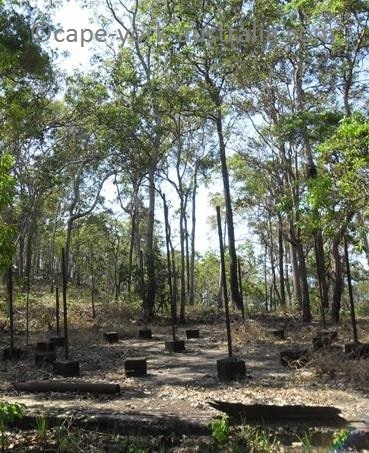 It later showed that the water source was not sufficient, and they went looking for better spots. 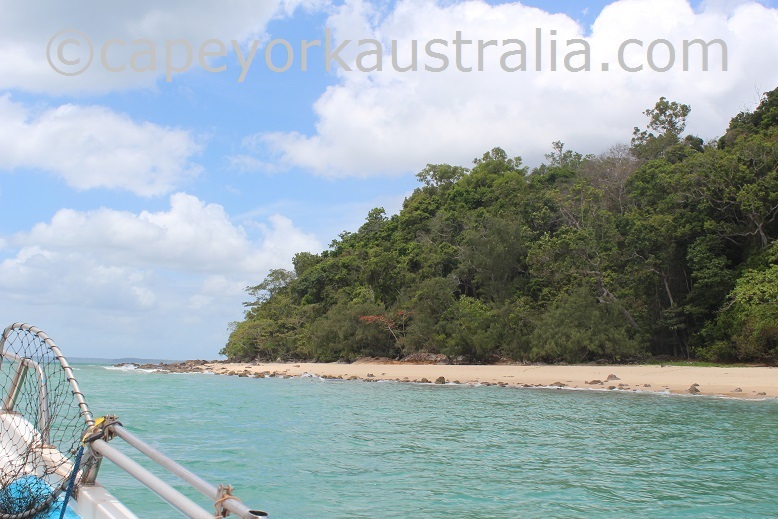 They got help from people at Injinoo, and together they found natural freshwater sources at Red Island Point (now Seisia Jetty) and what was then called Ichuru (now Bamaga). 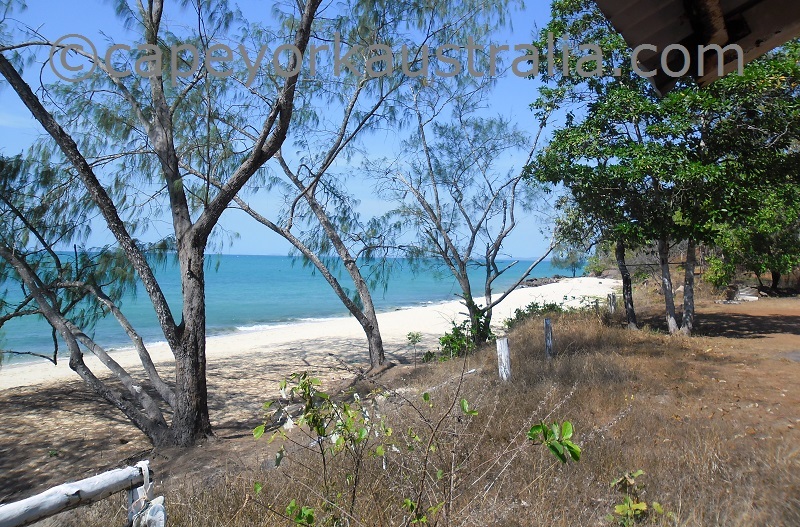 While the Bamaga township was built most families stayed in Mutee Head, and gradually moved to Bamaga as the housing was completed there. 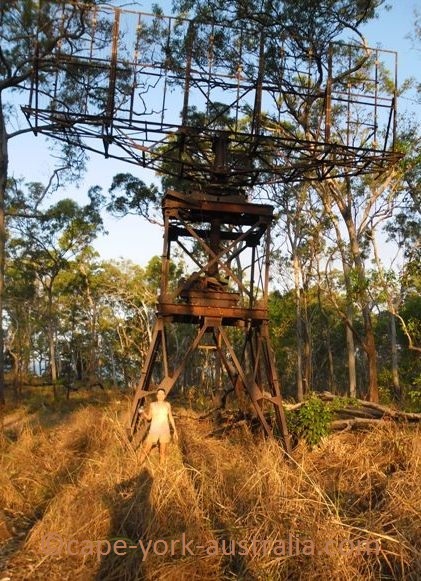 The above-mentioned track to the radar tower continues west to the mouth of Jardine River. 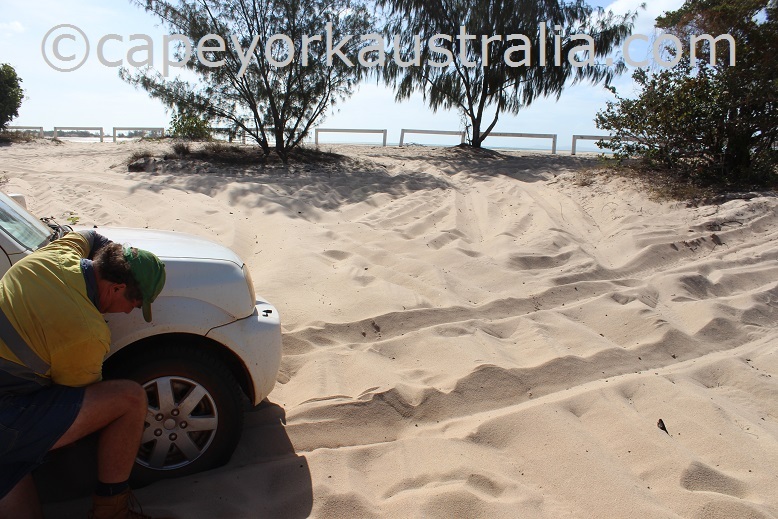 The track gets gradually sandier and in the end is definitely four wheel drive - it's narrow, bumpy and at times covered by soft boggy sands. Once you get to the river and behind the beach, it gets only boggier! 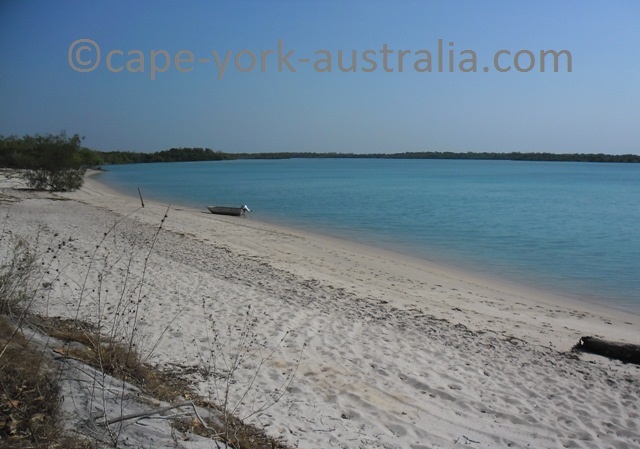 And the beach - on these sand bars you often see crocodiles. 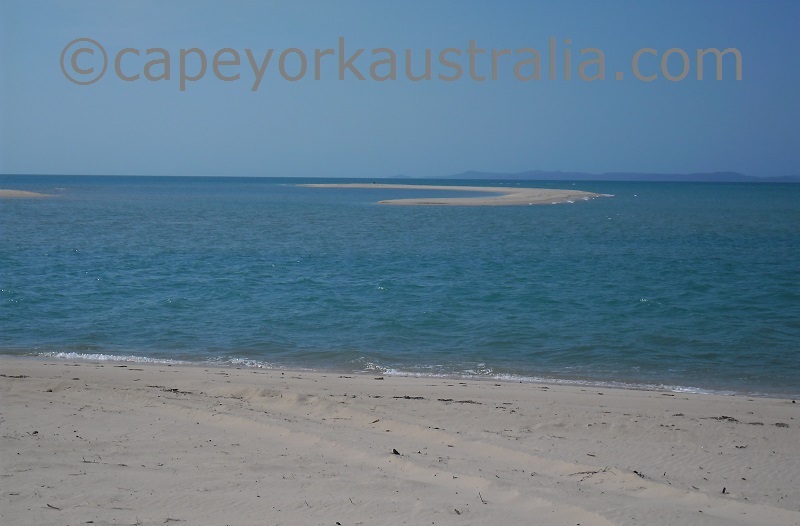 In the eastern end of the beach, you can see Mutee Head. 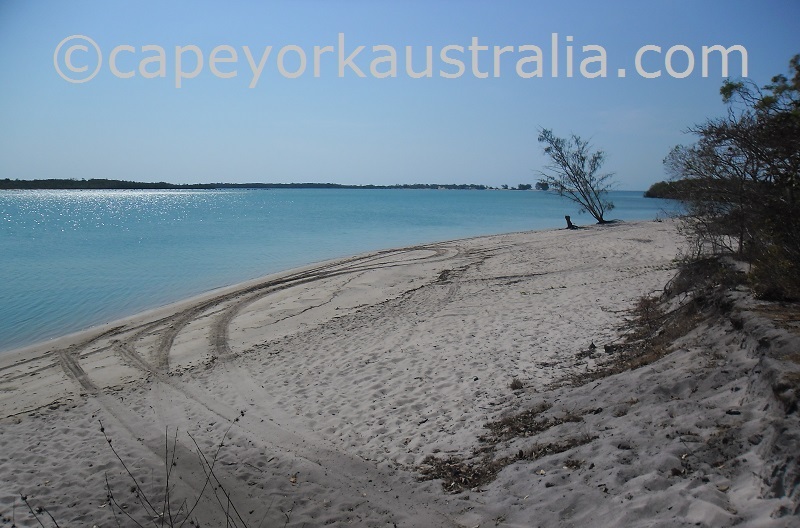 The place is on Aboriginal land - the new 2015 camping rules are in the Destination Guide, along with all the rest of the places on the peninsula.